An Axios report says that private equity firms love buying healthcare provider companies that wield a lot of market power, especially physician and ED staffing groups and air and ground ambulance companies. 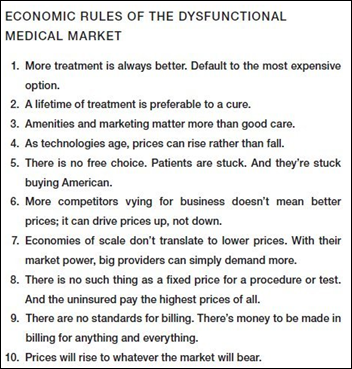 Those businesses make money when their providers are forced on hospital inpatients (often at out-of-network rates) or during moments when the patient has no choice. Part of the company’s high margins come from the “surprise” portion of bills that insurance doesn’t cover. The article was triggered by news of KKR’s planned acquisition of Envision Healthcare Corporation for $9.9 billion. 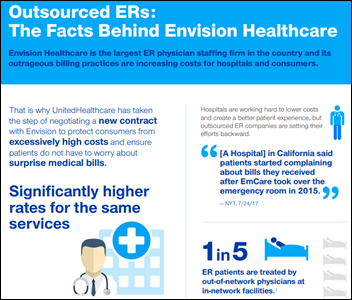 Envision provides ED doctors, hospitalists, anesthesiologists, radiology, and children’s services in 1,800 clinical departments in 45 states. It also operates a freestanding surgery center. 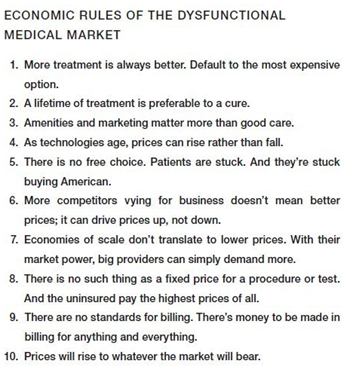 Elizabeth Rosenthal, author of last year’s bestseller “An American Sickness” and editor of Kaiser Health News, tweeted out in response her book’s rules of our medical market. This week’s question has generated quite a few heart-wrenching but sometimes uplifting recaps. I didn’t explain well why I solicited stories that are in ample supply elsewhere — these are coming from health IT peers and might resonate more strongly with struggling folks who work in our industry. My least-favorite word of the moment: “seasoned,” a self-descriptive adjective used mostly by executives but sometimes companies who feel their experience needs its own laudatory designator. The mental picture it always creates for me is either (a) someone getting salted and peppered, or (b) a person or company as a stack of firewood that has dried up and is ready to go up in flames. It’s kind of like “innovative,” “nimble,” “entrepreneurial,” and “successful” in being self-congratulatory, yet conveniently unquantifiable. Listening, only because it immediately caught my ear as played on a pirate sort of anti-corporate streaming radio station: Kevin Ayers, whose 1969 “Lady Rachel” was new to me (as was he himself, in fact). He was an original member of Soft Machine in the mid-1960s and played in the prog subtype of Canterbury Sound, which can range from whimsical to psychedelic, but always melodic (Soft Machine shared bills with Pink Floyd). Kevin died in 2013 at 68 with his Soft Machine heyday long passed. The lyrics and the voice he sings them in are kind of creepy: “Then she unwraps the parcel, And discovers a castle inside, The drawbridge is open, And a voice from the water, Says welcome my daughter, We’ve all been expecting you to come. She climbs…” His life’s finale was 2007’s “The Unfairground,” recorded with members of then-popular bands such as Teenage Fanclub and Roxy Music. 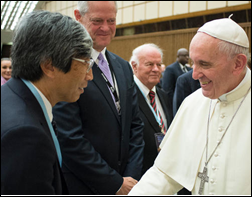 Billionaire doctor Patrick Soon-Shiong says that despite the poor stock performance and heavy criticism of his two publicly traded companies NantHealth and NantKwest, he will IPO a new chemotherapy development company later this year. Investors might want to proceed cautiously – shares in NantHealth and NantKwest have dropped 77 percent and 46 percent since their respective IPOs. 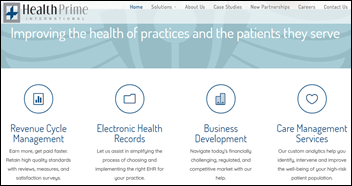 Private equity firm GPB Capital acquires Maryland-based RCM/EHR vendor Health Prime International. Among GPB’s other holdings are dozens of car dealerships, several garbage collection companies, a concert video streaming service, life sciences firms, and health IT vendors Cantata Health, ITelagen Healthcare, MDS Medical, and Meta Healthcare IT Solutions. Inova’s healthcare accelerator invests in CoverMyTest, which automates prior authorization workflow for genetic and genomic testing. The company name seems like it would be legally challengeable by McKesson-owned CoverMyMeds, which offers the same type of PA service for medications. Sentry Data Systems, which sells 340B hospital drug subsidy program software, wins the first round in its antitrust lawsuit against CVS, which bought its own 340B administrator and required that its hospital and clinic customers use that company exclusively. 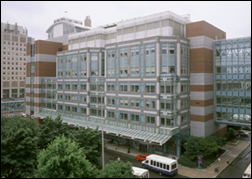 Moody’s downgrades the credit rating of Beth Israel Deaconess Medical Center parent CareGroup, citing concerns about its $534 million BIDMC expansion project and significantly lower margins at Mount Auburn Hospital following its $110 million FY2017 implementation of Epic. Moody’s also worries about planned Meditech upgrades at three CareGroup community hospitals. However, the ratings firm says a proposed merger with Lahey Health would create economy of scale and market share that could make CareGroup competitive with Partners HealthCare in the Boston area. John Elms (Connexall USA) joins nurse call system vendor Critical Alert Systems as CEO. 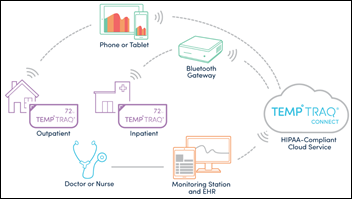 A Cincinnati Children’s study that is really small in sample size and scope finds that TempTraq’s Bluetooth-powered continuous temperature monitoring patch detects early fevers better than the usual episodic methods. The company says it can be integrated into central monitoring and EHR systems.TempTraq is part of Blue Spark Technologies, which makes flexible printed batteries similar to the temp-monitoring patch. The Concord newspaper profiles former medical software technologist Chris Stakutis, who is working on a skill for Amazon Alexa for elderly people that reads news and emails aloud, allows creating messages, and asks questions about their health. In Australia, doctor finder and appointment scheduling service HealthEngine is caught modifying more than half of patient-submitted practice reviews to make them sound more positive, with the local paper somehow tinkering with the site’s HTML to obtain before-and-after images. The company says it “has never intended to be a traditional ratings and review site” since its goal is to “celebrate high-performing practices” by publishing only positive reviews and sending negative ones privately to the practice (which is the real story that the paper mostly missed). Hopefully it takes fewer liberties with its medication management app. Meanwhile, it has removed the reviews from its site as it contemplates its future. A new KLAS report on digital rounding technologies – which includes rounding by nurses as well as non-clinical employees – finds the market to be immature, with few use cases and low customer expectations beyond replacing paper-based systems. Most of the vendors had too few customer responses to assure data validity. 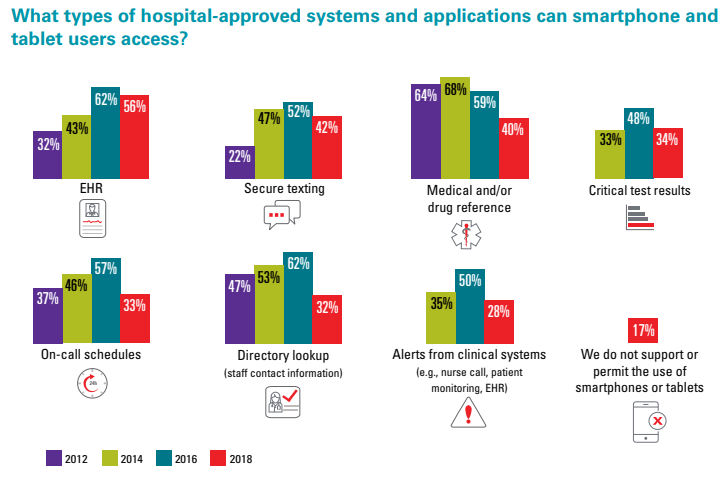 Spok’s annual mobile strategies report, derived from a smallish survey of 300 hospital employees, finds that 57 percent of hospitals have a mobile strategy, a decrease from 2017. 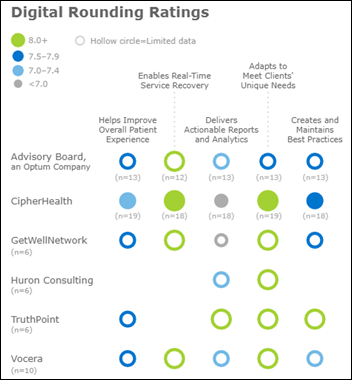 Half said their strategy addresses communications needs, with 25 percent each saying it’s either a clinical or a technology initiative. The survey found that clinicians are increasingly involved in developing mobile policies, mostly to offer input on technology selection and to improve adoption rates. In-house Wi-Fi and cellular coverage remains the biggest problem, reported by more than half of respondents. Weird News Andy gets this potty started by filing this breaking news item under Porta-Jong. A North Korean defector who served in the military says that Kim Jong-un always travels with his own private restroom, including one that’s installed in an armored black limousine for motorcading. WNA assumes that if Western intelligence agencies gained access to his leavings, it might lead to a serious data dump about his health, although he acknowledges that the rumor was leaked by a stool pigeon. ChartLogic’s ambulatory EHR earns ONC’s 2015 Edition certification, with the company noting that 100 percent of its clients who participated in its 2017 MIPS program attested successfully. Memorial Medical Center (TX) is featured in a video testimonial about its use of the hosted version of the Obix Perinatal Data System. Meditech posts a podcast titled “Rural Healthcare and the Role of the CIO,” featuring Methodist Hospital CIO and 2017 Gall CIO of the Year winner Randy McCleese. In Ireland, Aut Even Hospital moves to an integrated radiology department with Agfa HealthCare’s enterprise imaging. 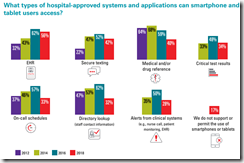 A new customer study shows that medical practices using Aprima’s EHR with Kno2 saved 103 hours per provider annually. 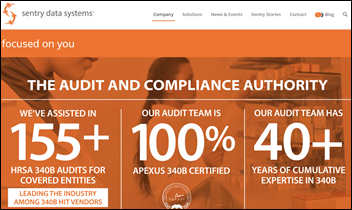 AssessURHealth publishes a new customer success story featuring Mark Weissman, MD of GMS Florida West Coast. Burwood Group accelerates its cloud management practice with the adoption of HyperGrid’s HyperCloud platform. Change Healthcare will exhibit at the AMDIS 2018 Physician-Computer Connection Symposium June 18-23 in Ojai, CA. 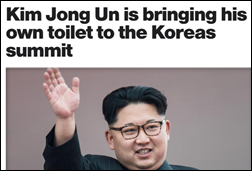 Hey there’s seems to be a possible real hunt for the stools of Kim Jong Un though, look what MIT wrote yesterday:) They are already pondering, so I guess that might answer why he wants his own toilet. “Those businesses make money when their providers are forced on hospital inpatients (often at out-of-network rates) or during moments when the patient has no choice. This sounds like the sort of thing that a company brags about 20 minutes before someone rolls a guillotine into the town square.